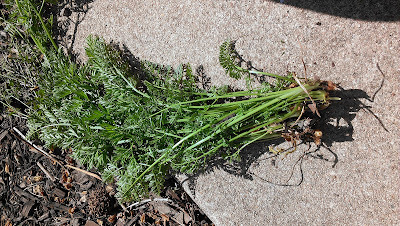 Anyway, I hadn't dealt with the weed previously because it didn't look like any of the other many weeds sprouting around my house -- it had nice, bright green frilly fronds (like the filler stuff florists use between the roses and carnations) and kind of looked like it had been planted intentionally. So I let it grow half out of laziness an half out of a hope that it would sprout some really pretty flower and add a little color to that sector of the yard. 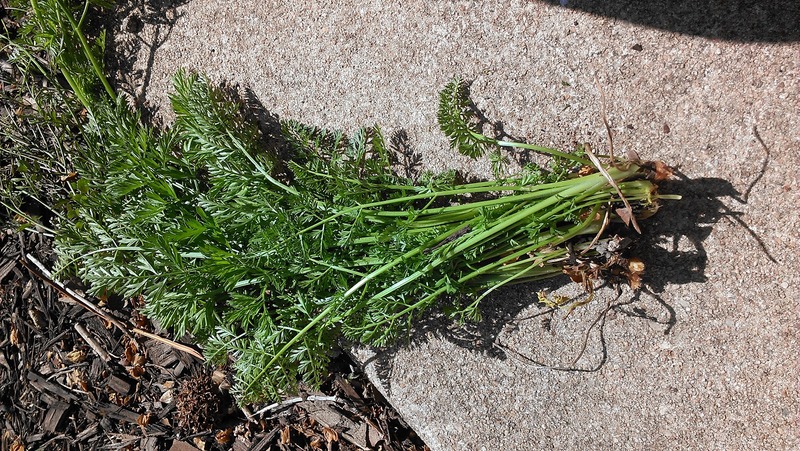 Well yesterday, I decided to be a responsible gardener/homeowner and dispatch of the obviously invasive plant (in my mind any plant in my yard that looks large and healthy without any sort of extra attention must be a weed ... which pretty much means that all of my most strapping greenery are actually weeds). I set Jovie down to play with (and probably eat) the the fluffy ball things that drop off of the tree in our front yard and yanked the weed. I ended up with a handful of fronds. I shoulda put a quarter or something next to it for comparison. FYI, it was larger than a quarter. Anyway, obviously, I got kind of suspicious about my weed after I got a good look at the root (I normally don't document any weeding I do. Let's be honest, I normally don't weed!) It was round and orange. The fronds had juicy, orange chunks stuck to the bottom of them that smelled vaguely familiar. Meet the world's ugliest carrot. A rogue carrot! In my front yard! 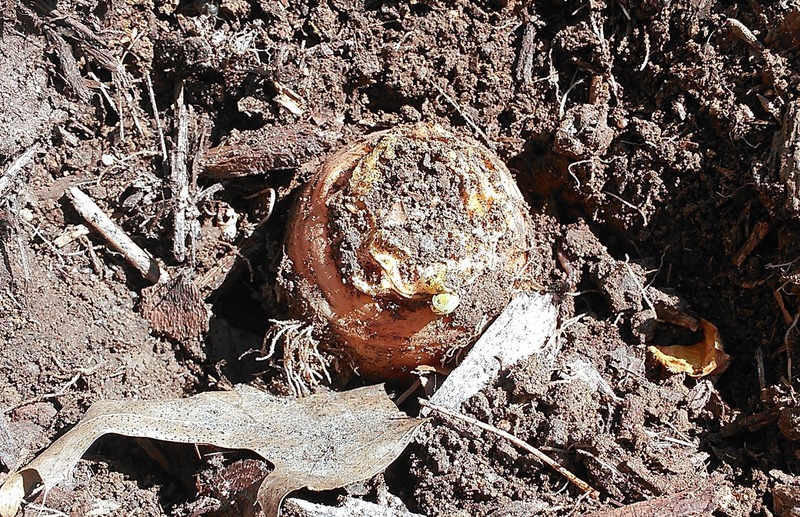 From whence did this edible taproot come? As regular readers know, I'm no stranger to stray produce popping up in my yard. But at least I knew the pumpkins were a result of my own half-assed composting techniques. This carrot is a total mystery. I didn't plant these either. 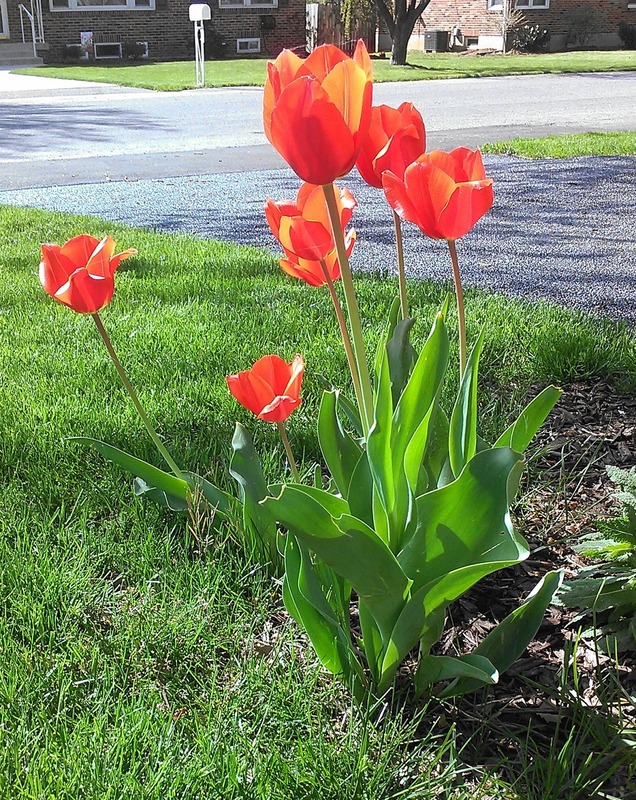 These tulips popped up in my yard last year. No, they aren't remnants of my house's previous owner (we've lived here four years with nary a tulip to be found until last year). Over the years I've planted daffodils, Black-eyed Susans (I know, so vain), poppies, irises, crocuses and mums (so many mums ... I run over them often). But no tulips. So how did they get there? I'm now all but certain I've been targeted by a modern day Johnny Appleseed (Johnny Carrotseed? Johnny Tulipbulb?) Someone with a green thumb is sneaking garden contraband on to my property for unknown reasons. I guess if we're going to be the victim of pranking, then we're pretty lucky. I mean, the tulips make me smile (even more because I have no idea where they came from) and as for the carrot, well, I threw it on a salad (Brad was very skeptical about the malformed carrot, noting that it's flavor stood out amongst the other salad items... and not in a good way). I run into people who read my columns or blog or whatever and comment about how they'd like to write, but never know what to write about. And I always put on my cheerleader pants (well, skirt I guess) and tell them to write. That if they feel the need to write, then they should write and it doesn't matter what it's about. When I found the carrot yesterday, I knew I had to write about it. Not because it was an extraordinary, life-altering event that taught me some sort of lasting life lesson. I knew I wanted to write about it because it was odd and made me laugh and gave me something to speculate about (also, the opportunities for metaphor were endless!!!). And I thought if I started writing about the carrot, that it would uproot* other ideas (like now I kinda think it'd be fun to have a character in my novel or some future novel who likes to sneak into people's yards at the dead of night and plant flowers). Writing -- or any art for that matter -- does not need to be a climb up Everest every time. Sometimes you unearth** simple truths by tackling simple topics -- like what happened today. And each time you sit down to document these happenings, I think you dig*** deeper into yourself. What you believe. What you dream about. What you hope for. What you hate. What you wish would change. It rounds you out and helps you make sense of the world. And it gets easier the more you do it. So if it's in you to write, then write. And whoever's out there rescuing my garden from my own black thumb, thank you. The Rogue Carrot (tm) is very cool! Today, we spread out all of the mulch that had been delivered in big bags last week and were sad to discover that the amount we purchased will only cover about 33% of the are that is desperately in need of mulch. So, on one hand, it didn't take (too) long to finish. But, on the other hand, our necessary financial outlay for mulch just trebled. Also, lifting bags of mulch can result in pulled back muscles, which is an exciting sign of being in your 40s. Finally, we also had a huge pumpkin patch sprout from our compost pile last year. It was pretty amazing. I'm looking forward to seeing what grows out of the compost pile this year. Maybe some scrapple. We often underestimate our mulch needs as well -- which result in Brad having to make extra trips to Lowes (thankfully only, like, two minutes from the house). And even despite the coverage we still have very persistent weeds (obviously). But yes, I love life springing forth from the compost pile ... even if that's not what the compost pile was technically meant for. Brad would definitely be wary of eating compost scrapple.